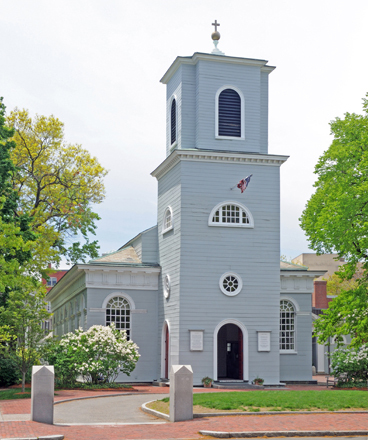 Christ Church (1761), Cambridge, Massachusetts. 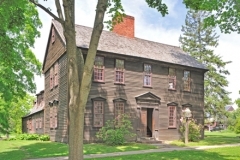 Designed by Peter Harrison, who also designed King's Chapel and the Shirley-Eustis House in the Boston area in addition to his notable work (Touro Synagogue inter alia) in Newport, Rhode Island (see 18th Century Connecticut and Rhode Island gallery). 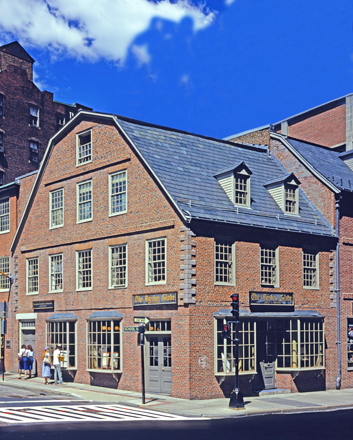 Old Corner Book Store (Thomas Crease House) (1712), Boston, Massachusetts. 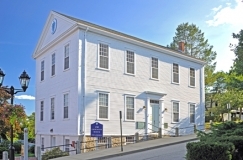 Originally an apothecary shop, the building became famous in the 19th century as the headquarters of the publishing house Ticknor and Fields who published noted New England authors Henry Wadsworth Longfellow, Oliver Wendell Holmes, Nathaniel Hawthorne, Ralph Waldo Emerson and others. The building displays a gambrel roof, several brick belt courses and quoins at the second story level. 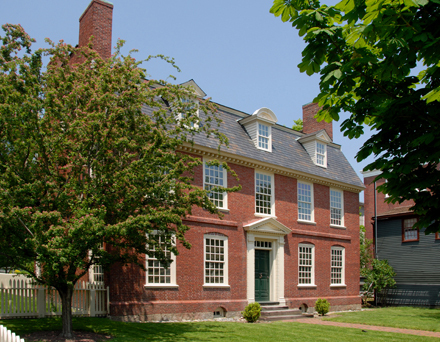 Ebenezer Hancock House (1767), Boston, Massachusetts. One of few surviving pre-revolutionary buildings in Boston. 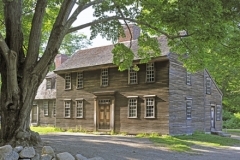 Owned by John Hancock. He allowed his younger brother, Ebenezer, to live here and operate the office of Deputy Paymaster General of the Continental Army. Hancock House Replica (built 1926) Ticonderoga, New York; South facade. The original Hancock House built on Beacon Hill, Boston, Massachusetts in 1737 by Thomas Hancock, John Hancock's uncle, was torn down for a private double-house residence in 1863. Fortunately, measured drawings were carefully made before the destruction took place. Hancock House Replica (built 1926) Ticonderoga, New York; From West. 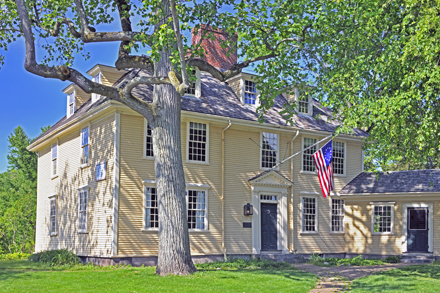 Courthouse (1749), Plymouth, Massachusetts. A plain clapboarded building with a pediment on east end and a simple entablature at entrance. 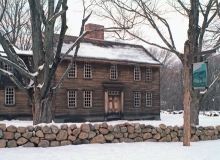 Captain William Smith House (late 17th or early 18th century), Lincoln, Massachusetts. This house sits on Battle Road - the line of retreat of the embattled British Regulars from Concord to Boston on April 19, 1775. Captain Smith led the Lincoln Militia that day. 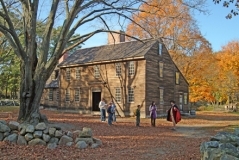 Minute Man National Historic Park. Richard Derby House (1762), Salem, Massachusetts. 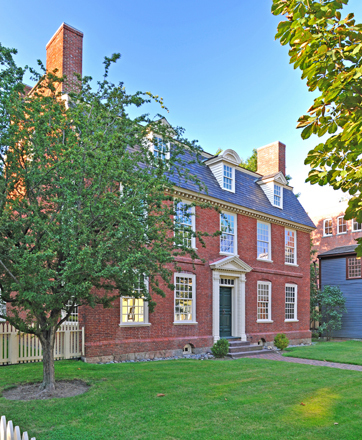 A simple, yet elegant Georgian brick home, displaying quiet and balanced Georgian architectural features. Salem Maritime National Historic Site. Richard Derby House (1762), Salem, Massachusetts. 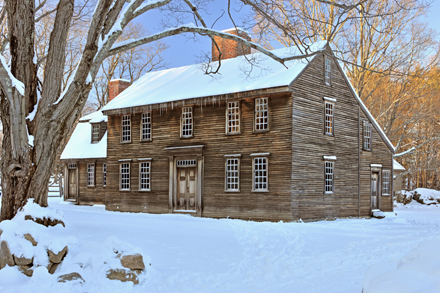 Dole-Little House (c 1715), Newbury, Massachusetts. Seated on a hill overlooking the Parker River this clapboarded center chimney colonial is shown in spring Lilacs. 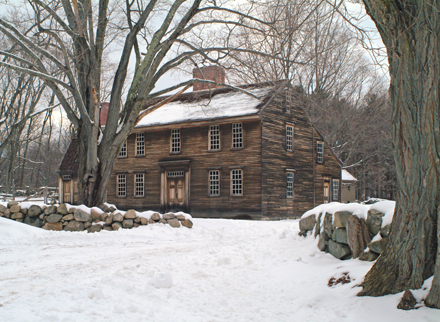 Hartwell Tavern (1733), Lincoln, Massachusetts; From south in winter. 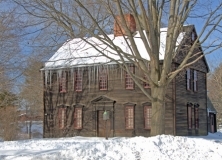 Hartwell Tavern (1733), Lincoln, Massachusetts; front elevation in winter. 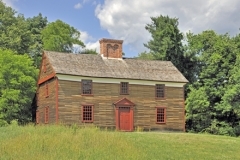 The tavern is on Battle Road, line of retreat of the British Regulars April 19, 1775. Minute Man National Historical Park. 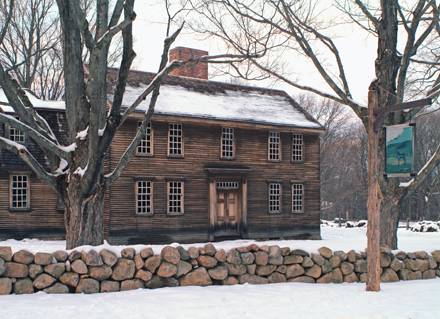 Hartwell Tavern (1733), Lincoln, Massachusetts; Facade and leanto in snow. 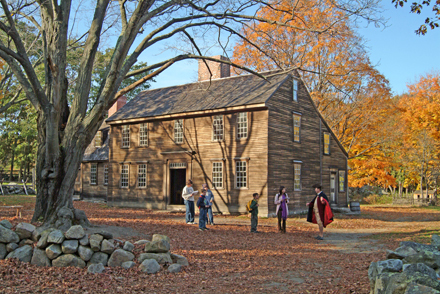 Hartwell Tavern (1733), Lincoln, Massachusetts; In fall foliage with visitors and costumed guide. 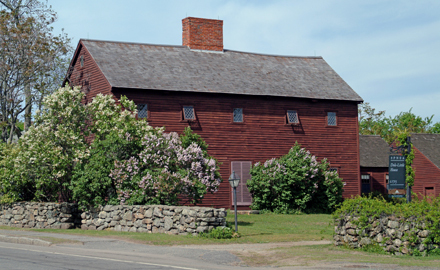 Hartwell Tavern (1733), Lincoln, Massachusetts; Spring view. The tavern is on Battle Road, line of retreat of the British Regulars April 19, 1775. Minute Man National Historical Park. 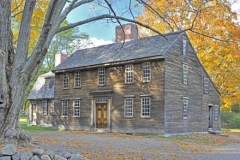 Hartwell Tavern (1733), Lincoln, Massachusetts; Facade and leanto in fall. 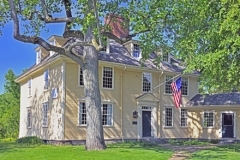 Buckman Tavern (c 1710) Lexington, Massachusetts.This tavern was prominent in the opening battle of the American Revolutionary War. 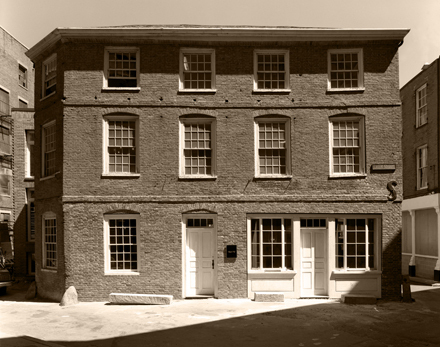 Lexington militia were here prior to the battle on April 19, 1775. 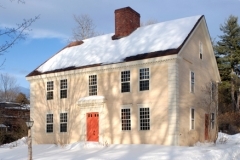 Historic Deerfield, Parsonage or Hoyt House; In snow. Part of historic Deerfield's "Street" of early Massachusetts houses.